Our Graphics Design Competition is now closed for entries. Here at Express Exhibition Displays we like to think we know our stuff when it comes to producing striking pop up banners, boards, signs or stands. That said, as with any industry, there’s always room for fresh eyes and innovative ideas. With this in mind, we invite any graphic design students or freelancers reading this to rally round. We have some exciting news to share with you! 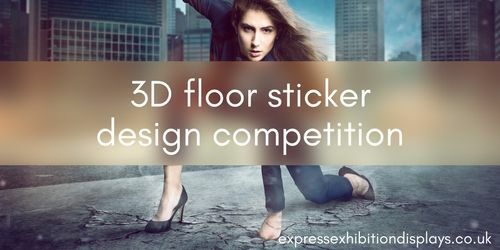 Today, we are officially launching our 3D floor stickers competition. What’s this all about, we hear you ask? We’re tasking you with the following – to design a 3D floor graphic to attract attention from above! Indeed, it’s one thing catching a potential customers eye at, well, eye level…but what about drawing someone’s attention to the floor? A slightly more difficult feat in our opinion. Which is why we’re turning the tables and asking you to get experimental! The criteria for the winning pitch is simple – whichever design we deem the most creative will be successful. Whether it’s holes in the floor, descending steps, flames, animals leaping – you name it, nothing is off bounds! All we ask is that you submit a flat image design with a 3D element that could be used as a floor sticker. See our Pinterest board for some inspiration of floor stickers that work well for an idea of what we’re looking for! The best entry will receive 500 pounds and will be featured on our website as an example of 3D floor graphics. Not only that, but your design could potentially be sold by EED to be used by multiple brands. This is an amazing opportunity to showcase your skills and talent and to get some valuable experience on your CV! An image file as a mock up of your floor graphic design where you think it would work well (bottom of an escalator, on a stair case, in a shop etc). So, what are you waiting for? Get your thinking cap on and enter our competition today (it closes on 26 January 2018). That’s sufficient time to let the Christmas festivities inspire your creative thinking and imagination. We can’t wait to see what designs you come up with! If you require any more information about our graphic design competition, please don’t hesitate to contact us at marketing@expressexhibitiondisplays.co.uk.